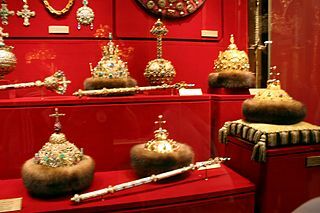 The Crown Jewels of the Kingdom of Greece are a set of symbolic regalia (crown, sceptre and sphere) that were created for King Otto I shortly after his election to the throne in 1832. After his election to the throne of Greece in 1832, Otto ordered a crown, orb, sceptre and sword from Fossin et Fils Goldsmiths in Paris; the sword, however, was made by Jules Manceaux. The regalia arrived in Greece in 1835 and was modelled on the regalia of Bavaria but they did not have any precious stones (especially the crown) and thus they resemble funerary European regalia. They were made of precious metals, mainly gold and perhaps partly silver. He established them as the royal regalia of the Crown of Greece but they were not used for a coronation as Otto was never crowned. In 1862 a coup overthrew Otto and the king was forced into exile, as he left returning to Bavaria he took with him the regalia. With his death, they were bequeathed to Prince Leopold, Otto's successor and pretender to the Greek throne.. Almost a century later, in December 1959, Albrecht, Duke of Bavaria, head of the House of Wittelsbach and descendant of Prince Leopold, sent his son Maximilian-Emmanuel to Athens in order to formally recognize the rights to the throne of the Oldenburg House. The Prince then handed over all the regalia that Otto had taken with him in exile, to King Paul I of Greece. ^ Λόρεντς Σέλιγκ, 2000. "Τα βασιλικά εμβλήματα του Όθωνα", στο Κασιμάτη, Μ.Ζ. (επιμ. ), Αθήνα Μόναχο, Τέχνη και Πολιτισμός στη νέα Ελλάδα, σσ. 179–187. ^ a b Ricardo Mateos Sainz de Medrano, La Familia de la Reina Sofίa, La Dinastía griega, la Casa de Hannover y los reales primos de Europa, Madrid, La Esfera de los Libros, 2004, p. 130. John Van der Kiste, Kings of the Hellenes: The Greek Kings 1863-1974 (Sutton Publishing, 1994). The House of Wittelsbach is a European royal family and a German dynasty from Bavaria. Leopold I was a German prince who became the first King of the Belgians following the country's independence in 1830. He reigned between July 1831 and December 1865. Maximilian II reigned as King of Bavaria between 1848 and 1864. Leopold Maximilian Joseph Maria Arnulf, Prinz von Bayern was born in Munich, the son of Prince Regent Luitpold of Bavaria (1821–1912) and his wife Archduchess Augusta of Austria (1825–1864). He was a Field Marshal (Generalfeldmarschall) who commanded German and Austro-Hungarian forces on the Eastern Front in World War I.
Luitpold, Prince Regent of Bavaria, was the de facto ruler of Bavaria from 1886 to 1912, due to the incapacity of his nephews, King Ludwig II for three days and King Otto for 26 years. Prince Philippe of Belgium, Count of Flanders was the third born son of Leopold I, King of the Belgians and his wife Louise d'Orléans (1812–1850). He was born at the Château de Laeken, near Brussels, Belgium. 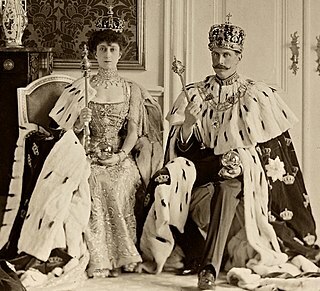 The Monarchy of Greece or Greek Monarchy was the government in which a hereditary monarch was the sovereign of the Kingdom of Greece from 1832 to 1924 and 1935 to 1973. This is a list of kings of the modern state of Greece. The Kingdom of Greece was ruled by the House of Wittelsbach between 1832 and 1862 and by the House of Glücksburg from 1862 to 1924, temporarily abolished during the Second Hellenic Republic, and from 1935 to 1973, when it was permanently abolished and replaced by the Third Hellenic Republic.